As I've stated previously, it's well known that Martin draws from historical events as catalysts to events in his novels. The chaos in Westeros is reminiscent of the tumultuous events of the War of the Roses. One of the figures from that conflict shares a startling number of similarities with Cersei Lannister: Margaret of Anjou. Margaret of Anjou is known by some as a vengeful, and ambitious woman, that brought perpetual strife, war, and misery to England. Some readers would say that Cersei Lannister does the same in Westeros. Margaret's childhood was tempestuous at best. Margaret was raised in the middle of a family feud between her father, and her father's uncle, which resulted in her father being imprisoned for several years. Although it never lead to imprisonment, this correlates to Cersei Lannister's own upbringing. After facing the death of her mother, Joanna, while birthing her brother, Tyrion, Cersei was not only motherless-her father's personality changed drastically as well. After the death of his wife, Tywin became cold and bitter. In addition, there was always some residual tension between Tywin, and the King at the time, Aerys II. According to Ser Barristan Selmy, Aerys lusted after Joanna, even going so far as to making inappropriate japes on the wedding night. That alone would be enough to cause a small "feud," erupting between the Targaryen's and the Lannister's, which would eventually go on to shape Cersei's future. It's well known that Tywin consistently promised Cersei that Prince Rhaegar would be her future husband, and that Cersei would be Queen one day. That being said, Aerys spurned Tywin's offer, and insisted instead that Rhaegar marry Elia Martell. In addition, Cersei had manipulated Jamie, her twin (and her future lover and Father of her children) into joining the Kingsguard, ostensibly to remain close to her in King's Landing. This backfired. Tensions had grown between Aerys and Tywin so much, that when Aerys rebuffed the offer of Cersei's hand, Tywin packed up, and left King's Landing with Cersei. Jamie, as a member of the Kingsguard, remained. Aerys descent into madness, the abduction of Lyanna Stark, and the subsequent Robert's Rebellion (or War of the Usurper) set into motion events that would crown Cersei Queen of Westeros. When the smoke cleared, Robert Baratheon stood victorious at the trident, with Rhaeger's blood (and rubies) scattered everywhere. Jamie Lannister sat on the Irone Throne, awaiting Ned Stark, with the blood of Aerys upon his sword. After the chaos of the rebellion, Cersei was crowned, and, for a time, there was peace in Westeros. On April 23rd, 1445, Margaret of Anjou was married to King Henry VI of England. This marriage not only trounced the chances of the House Of York to obtain a bride for Henry VI, but it also provided a temporary suspension of fighting known as the Hundred Years War between France and England. Margaret's husband, Henry VI, was a notoriously incompetent King. In fact, Henry VI's apparent incapacity to manage government is one of the reasons why the War of The Roses Started. In the latter years of Henry VI's reign, the monarchy became increasingly unpopular due to corruption, and the steady troubled state of the crown's finances. It can be confirmed that nobody named Petyr Baelish could be found at Henry VI's court, nor was it documented that the Crown of England was borrowing hefty sums from the Iron Bank of Braavos. That being said, the similarities exist between the court of Henry VI and the court of Robert I.
Margaret of Anjou also had difficulty maintaining the legitimacy of her child-something Cersei Lannister knows all too well. Margaret's troubles are completely different than Cersei's. Henry VI also had a mental breakdown in August of 1453. The breakdown left Henry VI in somewhat of a functioning catatonic stupor, without the ability to recognize anything that was going around him. This proved to Margaret's detriment, as she gave birth to their first son, Edward. Because of his mental state, Henry VI was unable to acknowledge the child. This event, coupled with his mental health challenges, fostered rumors spreading that Edward was not Henry VI's child, or true heir. Cersei has legitimacy and rumor problems of her own, thanks to Malleon's Book, and the fact that the father of her children truly is her brother. After Henry VI's recovery, Margaret became heavily involved in politics, defending her son's claim as heir. During this time, various claimants to the throne began to rise, and The War of the Roses began. "Fair son, what death shall these knights die?" Prince Edward promptly responded that the knights should be decapitated, despite the King's pleas for mercy, and the horror of everyone who witnessed the event. This event (although the circumstances are different) is eerily similar to the beheading of Eddard Stark on the Sept, with Joffrey in place of Edward. 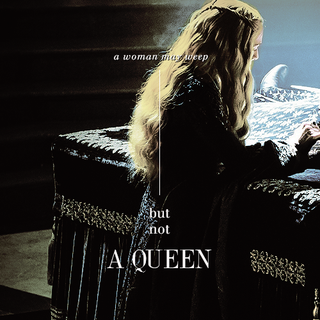 The views of the common people in England, or small folk in Westeros, are universal for these two Queens. Margaret was ubiquitously disliked by her subjects, who viewed her as a woman whose grim purpose was to hold onto the crown for her progeny. Cersei is viewed similarly by the smallfolk. Although Margaret gained a reputation for being ambitious and ruthless, her spirit was broken after the defeat of her forces and the death of her only child and son at the Battle of Tewkesbury. Margaret was taken captive after the battle, imprisoned, and held until she was ransomed for by King Louis XI of France in 1475. She lived for seven more years, and died impoverished in August of 1482. "I am Cersei of House Lannister, a lion of the Rock, the rightful queen of these Seven Kingdoms, trueborn daughter of Tywin Lannister. And hair grows back." Determined, enterprising, and fiercely protective of their child's claim to the throne, Margaret of Anjou and Cersei Lannister can be summed up in three words, which the Lannister's know all too well: "Hear me roar."